Last week, the New York Times reported that New York City officials are “moving to cap the number of vehicles driving for Uber and other ride-hailing services,” amid concerns over congestion, the exploitation of drivers’ wages, and the livelihood of the city’s iconic yellow cab drivers. 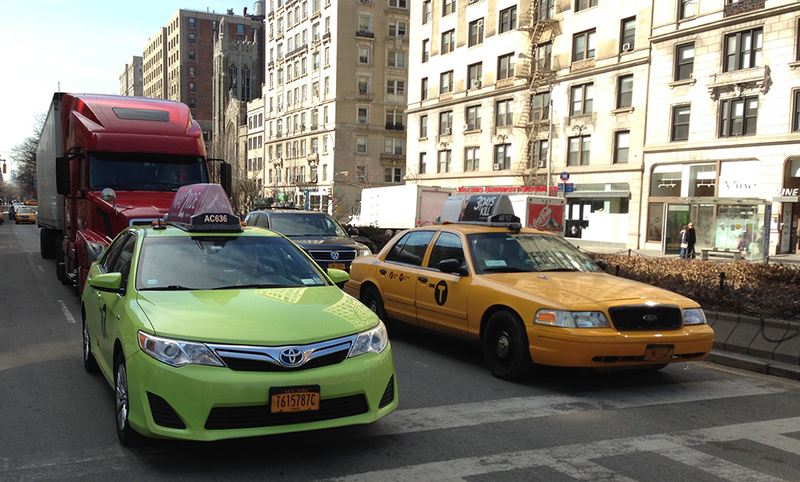 If passed, the legislation would make New York the first major American city to limit the number of for-hire vehicles. A recent report by Schaller Consulting titled The New Automobility: Lyft, Uber and the Future of American Cities suggests that shared ride services such as UberPOOL and Lyft “while touted as reducing traffic, in fact add mileage to city streets.” They are reported to increase congestion on city streets by up to 160 percent. The Transportation Network Companies (TNCs) in total added 5.7 billion miles of driving in the nation’s nine largest metro areas. The rivalry between taxi and Uber drivers has pushed down the price of riding in the city, and there are increasing concerns over the dwindling wages of Uber drivers and the estimated 70,000 app drivers who earn less than the minimum wage. TNCs are known to recruit more drivers than needed to minimize their customers’ wait time. Taxi drivers aren’t faring much better; as customers have flocked to app-based rides, drivers have felt the weight economically. Since December, six taxi drivers have committed suicide over their failing businesses. As the city debates the merit and harms being done by app-based car companies, the cap had been suggested by the City Council as a potential solution to these problems. However, the cap may not work as intended. As Streetsblog NYC theorizes, “an Uber ceiling will encourage permit-holders to rent their idle vehicles to other drives who want in.” It is believed that the cap could further dilute driver earnings. Uber and Lyft recently offer an alternative by proposing to create a $100 million fund for the medallion drivers in exchange for doing away with the cap. The Verge reported on the “hardship fund,” which was “summarily rejected” by the City Council and Mayor Bill de Blasio’s office. The TNCs are expected to continue to scramble to rally against the bill. The City Council will vote on it next week.